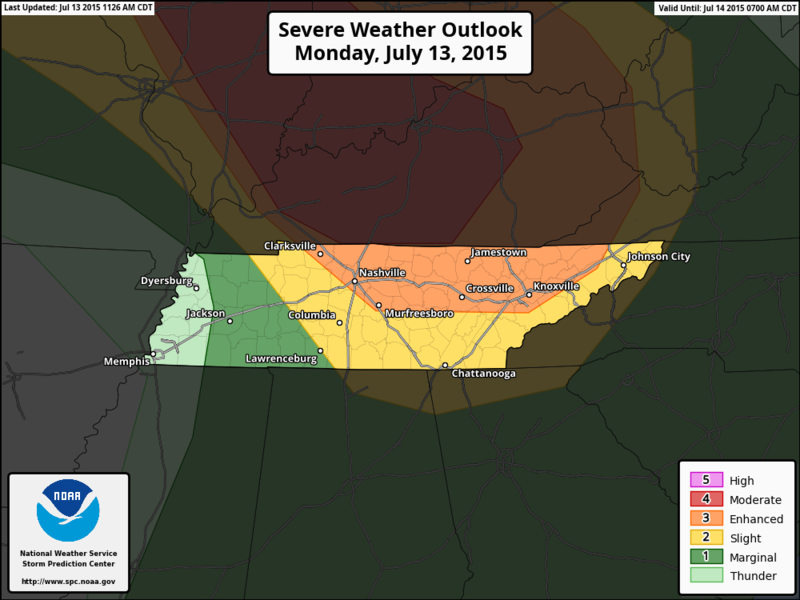 Summary: SLIGHT chance of severe storms today. Better chance of severe storms tomorrow. Heat and humidity still holding strong through the rest of the week. 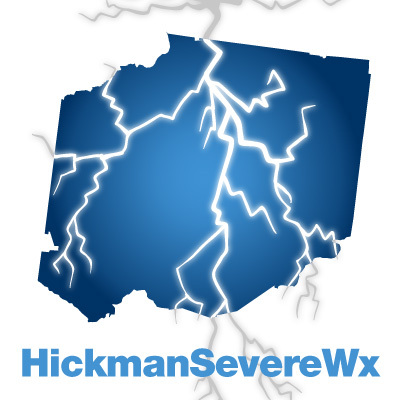 As the events get closer to us, we will be nowcasting on our Twitter @HickmanSevereWx and updating this post as more information becomes available and is warranted. New updated will be posted right below this text and above the original post. So we are battling two weather hazards for today and tomorrow: the heat and humidity sending heat index values to the mid 100’s and a chance for severe thunderstorms with wind damage and hail being the main threats. For today, it will be mostly sunny with virtually no chance of rain during the daylight hours. Our high temperature will reach 94 degrees, putting the heat index at about 101 degrees when you factor in humidity. Even though there is no forecasted chance of rain, there might be a sprinkle or two give to a few lucky homes in Hickman County while the sun is up, but not counting on it too much based on the models. The Storm Prediction Center (SPC) has us in the SLIGHT category for severe weather starting at 7am this morning and goes through 7am Tuesday morning. With these categories come a 30% chance of seeing damaging winds 55+mph or greater within 25 miles of a point, and 5% chance of seeing large hail greater than 1 inch in diameter within 25 miles of a point. The scenario is that the current bow echo storms moving through Indiana and Ohio right now will make its way toward East Tennessee today, bringing with it possible damaging winds, large hail, and a possible isolated tornado to areas east of I65. It is also even possible that this could turn into a derecho, which are large bow echo storms that cause a path of wind damage and are fast movers. The way the storms are coming puts them on the other side of I65 from us, so we are likely not going to see as much action as our eastern neighbors may. More storms are expected to develop west of the current storm line in Illinois later today, these storms will also make their way toward Middle Tennessee later tonight, but are still expected to go east of I65. Checking out the models, here’s the HRRR loop, which starts at 10am today and ends at midnight. The NAM4 model also shows not much for us during the day today as well. Tonight is when things start to pick up. We have a 20% chance of storms overnight tonight while our overnight low remains at a muggy 76 degrees. Storms are likely to push in in the early morning hours. You can see some of that going on in the HRRR loop above. NAM4 appears to agree but with a bit increased intensity. 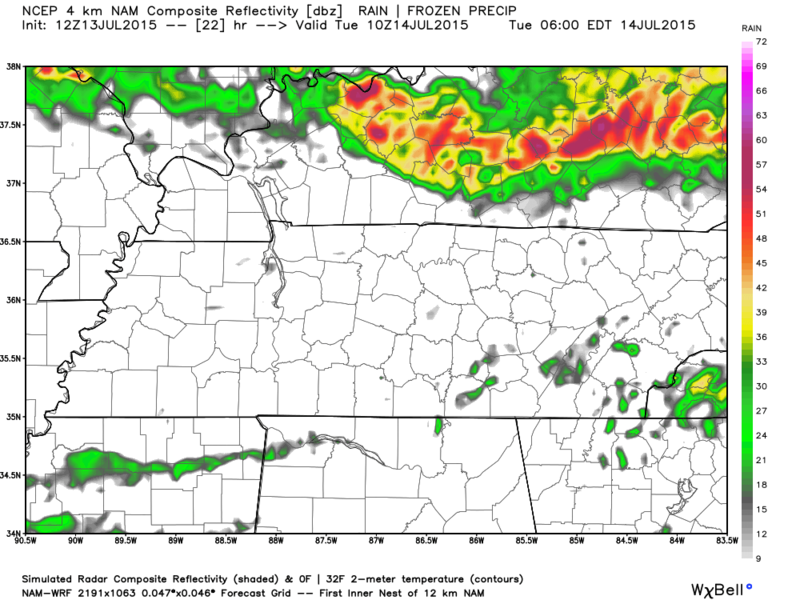 Here’s NAM4’s simulated radar for 5 am Tuesday. 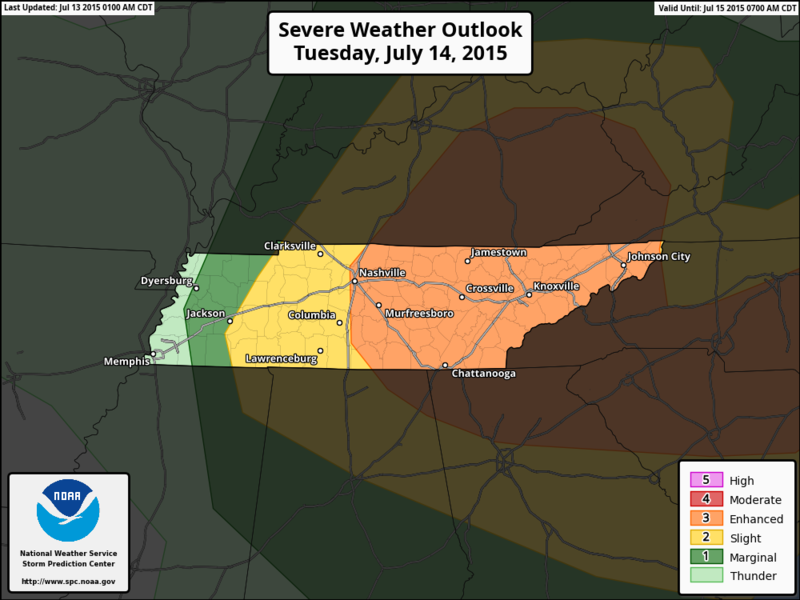 Tuesday looks to be the better day for storms for Hickman County. Tuesday’s storm chances increase to 40% while our high temperature works its way up to 92 degrees, putting our heat index at 103 when you factor in humidity. Winds will be gusty out of the west at 10 to 15 mph. The SPC has went ahead and placed us in the SLIGHT category for severe weather again for Tuesday starting at 7am and goes through Wednesday 7am. 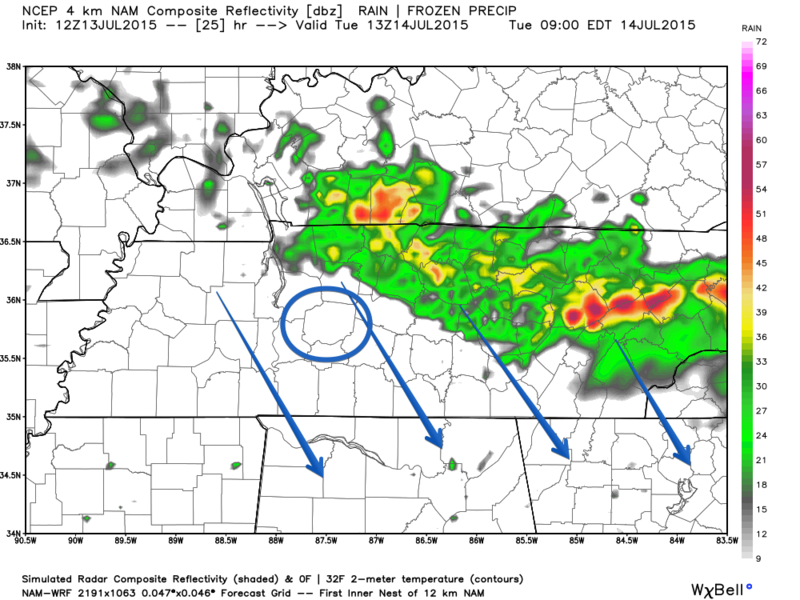 The models are showing rain and storms start to come in during the morning hours. Here’s NAM4’s simulated radar for 8am Tuesday morning. These showers fade away and don’t seem to want to come to Hickman County. Here’s NAM4’s look at 10am. 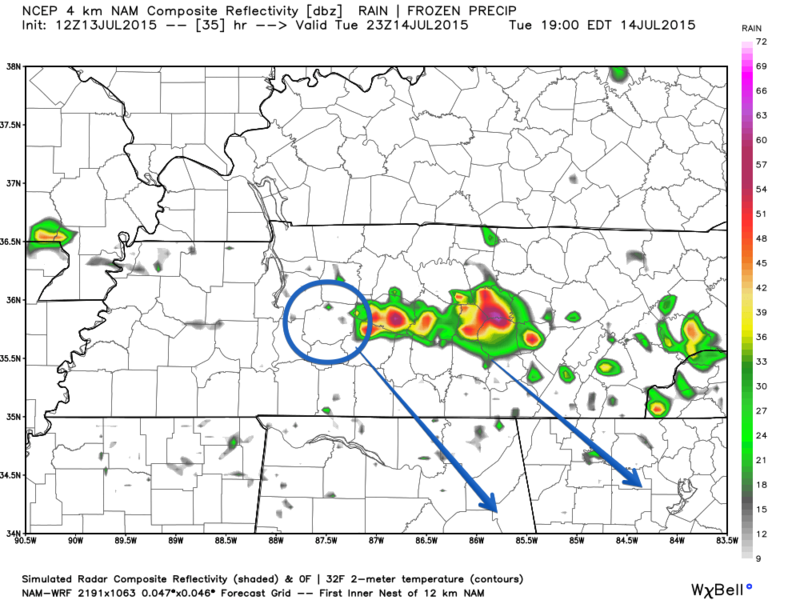 Storms die off in Middle Tennessee during the day but popup storms start to come back in the afternoon hours. Here’s NAM4’s look at 6pm. 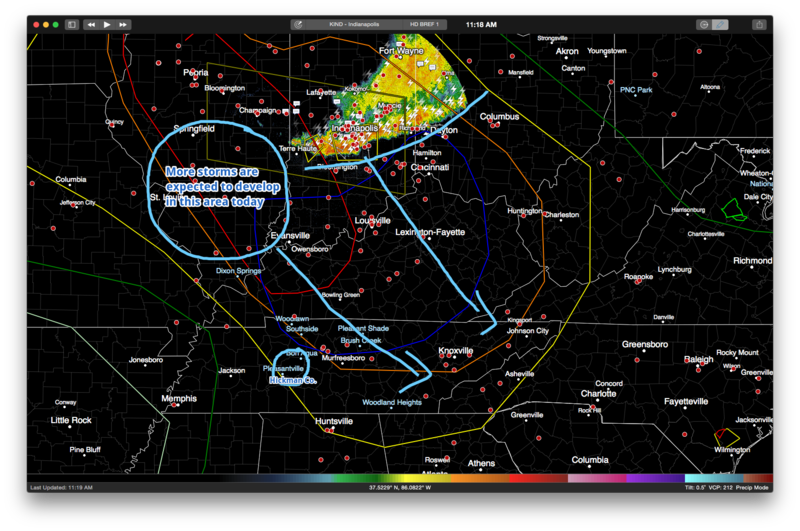 It’s important to note that the placement of these storms are not exact, but just an educated guess. This means that storms are likely to start popping and could be around the area, so we will pay particular attention here. Why? Because the storms are likely to feed off of each other and continue to grow, possibly into supercell storms. 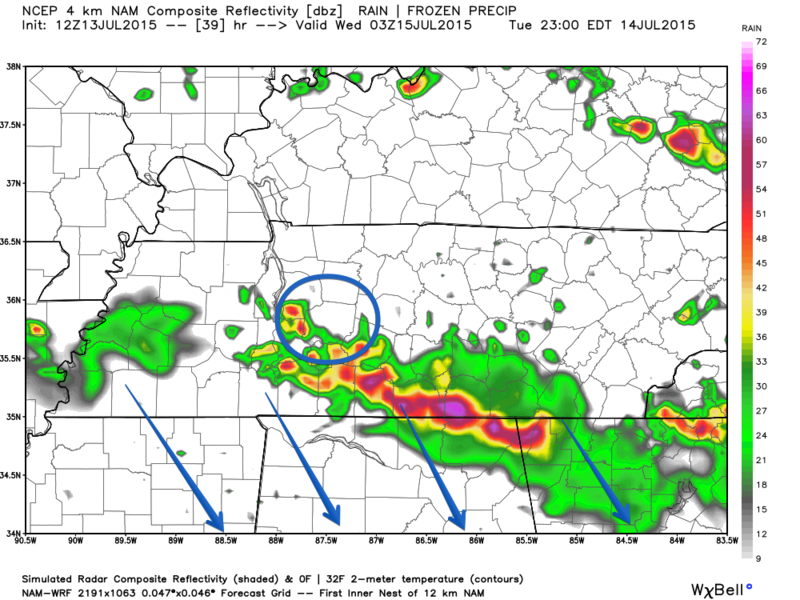 Here’s NAM4’s look at 10pm. Again, the placement of these storms isn’t exact, but just a guess. Once these move through the storm chances should go down overnight Tuesday and into Wednesday. Wednesday sees a 20% chance of showers and storms, but we are currently not outlooked for severe weather.